In this episode Luke Lohr and Pedro Gomes are joined by Nicholas Murray, Communications Coordinator for the United Soccer Leagues, to talk about the many hats he wears in supporting USL, players to watch and twitter avatars. 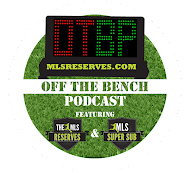 Luke and Pedro discuss the impressive form of the US National Team and DC United brings stadium news to the table. All that and the NASL is expanding. This episode is a fun one. Enjoy. Check out these highlights from the US Men's National Team's victory over Honduras. It's a thing of beauty.